Figure 3: BAAM 3D printer. Figure 4: The blade section on the printed mould. There are serious opportunities for Additive Manufacturing (AM) in the wind energy industry. Here, materials scientist Inês Castro from Matmatch outlines five key areas. Additive manufacturing, also known as 3D printing is “the process of making parts from 3D model data, usually layer upon layer, as opposed to subtractive manufacturing and formative manufacturing technologies” . Contrasting with these latter technologies, AM can produce components with complex geometries, consume fewer raw-materials, produce less waste, have decreased energy consumption and reduced time-to-market. Adding numbers, AM can speed up the development time by up to 75%, reduce material resources by up to 65% and reduce gas emissions by up to 30% . Moreover, a single part can be manufactured in one step, not requiring a secondary joining process [3,4]. In the early stages of being introduced to the market, AM was used to create and develop models and prototypes. However, due to all of the advantages offered, the market for 3D printed products started to grow, especially in areas with short-run production and with high customisation and freedom of design . There are several additive manufacturing processes and techniques that can be classified in terms of heat source, the feedstock and the manipulator . The processes can be applicable to multiple types of material, including polymers, which are more common and developed, also composites, ceramics and metals . The Global Wind Energy Council has stated that the wind industry is experiencing exponential growth recently with the aid of the offshore wind turbines market. Thus, development and innovation through materials and manufacturing technologies are essential for the wind industry to prosper and to continue increasing its annual energy production . The blades rotate and shift with the action of the wind, making the rotor spin. The gearbox makes the connection between the low-speed shaft to the high-speed shaft, increasing the rotations per minute from 30 to 60 rpm to approximately 1000 to 1800 rpm, in turn making it possible for the generator to produce electric power. The tower supports the turbine’s structure, with the nacelle containing and protecting the components on top of the tower . AM technologies show a lot of potential when it comes to the wind power industry, as it could in the future enable in-situ manufacture of turbine components that are designed for the unique needs of the resources of a particular location. This would, for example, decrease the shipping, transportation and handling costs and increase the rate at which new blade prototypes can be tested. 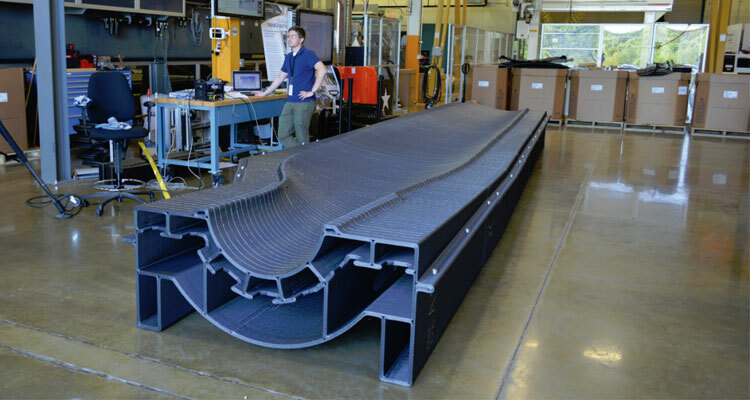 The Advanced Manufacturing Office (AMO) of the US Department of Energy has started to print moulds for the blades with AM technologies, as shown in figure 2. Consequently, it can make wind energy a more market competitive technology. The expansion of this application in the mould industry would reduce the steps, the cost and the time for mould fabrication, as the traditional route is a process that may take several weeks to months to achieve in its totality [6,10]. The mould in figure 2 was created by joining multiple printed sections created in the Big Area Additive Manufacturing (BAAM, figure 3) 3D printer at Oak Ridge National Laboratory . As a result, a scale model of the turbine (figure 5) was developed using a Printrbot Simple Metal 3D printer . It included the blades, hubs, rotor connectors, the frame and the blade ends, which would be the most expensive components if made through traditional manufacturing methods . Large scale metal AM or wire and arc additive manufacture is an emerging technology which may facilitate the printing of large-scale parts. 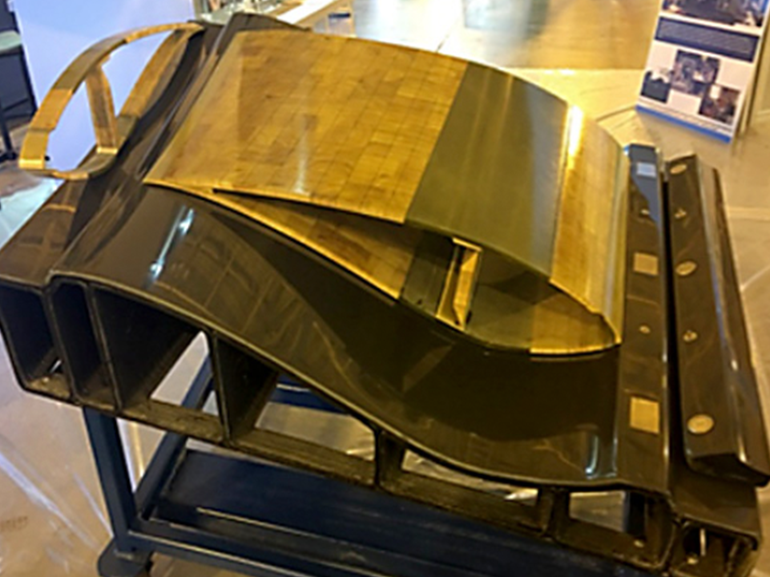 This even makes additive manufacturing of the nacelle and blade moulds possible, as it doesn’t need a constricted operation room, allowing as the name indicates, large-scale applications. Overall, additive manufacturing technologies offer a wide range of advantages for the wind industry. The examples given show that implementation is possible, and even recommended, for a more market-competitive energy supplier. After the technologies became more developed, reliable and standardised, the supplier chains will be reduced and the production could be more localised, reducing the transportation times and costs, allowing the further implementation of AM in the wind industry. ISO/ASTM 52900:2015, “Additive manufacturing - General principles - Terminology,” [Online]. [Accessed on 3 11 2018]. Siemens, “From design to repair - AM changes everything,” [Online]. Available: https://www.siemens.com/global/en/home/products/energy/services/maintenance/parts/additive- manufacturing.html#. [Accessed on 10 11 2018]. F. Martina e S. Williams, “Wire+arc additive manufacturing vs. traditional machining from solid: acost comparison,” Cranfield University, 2015. M. Froese, “Windpower-Engineering & Development,” 04 01 2017. [Online]. Available: https://www.windpowerengineering.com/business-news-projects/blade-materials-manufacturing- changing-keep-larger-turbines/. [Accessed on A 11 11 2018]. Wind Energy Technologies Office, “The inside of a wind turbine,” [Online]. 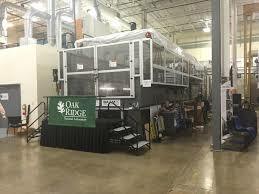 Available: https://www.energy.gov/eere/wind/inside-wind-turbine-0. [Accessed on 10 11 2018]. S. Goehrke, “3DPRINT.COM,” 09 02 2015. [Online]. Available: https://3dprint.com/43449/rmrd-tech-small-wind-turbines/. [Accessed on 06 11 2018]. 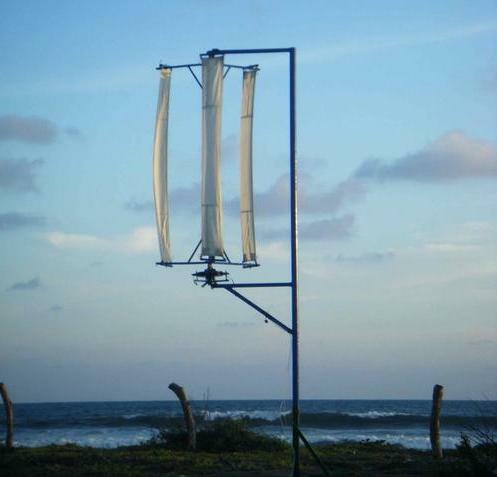 3D printer an 3D printing news, “Student develops portable 3D printed wind turbines to bring affordable electricity to remote areas,” 09 02 2015. [Online]. Available: https://www.3ders.org/articles/20150209-canadian-student-develops-3d-printed-open-source- wind-turbines-for-remote-regions.html. [Accessed on 10 11 2018]. B. Post, B. Richardson, S. Palmer, L. Love, D. Lee, P. Kurup, J. D.S., T. Remo e M. Mann, “The Current State of Additive Manufacturing in Wind Energy Systems,” Oak Ridge National Laboratory, no ORNL/TM-2017/479, 2017. F. Martina, “Investigation of methods to manipulate geometry, microstructure and mechanical properties in titanium large scale Wire + Arc additive manufacturing,” PhD Thesis - School of Aerospace, Transport and Manufacturing, Academic year 2013-2014.